Sometimes, you need to punch your day in the face. Sometimes a regular cup of coffee just won't do. Sometimes, you need to punch your day in the face. It is for those occasions that the Fisticup was invented. 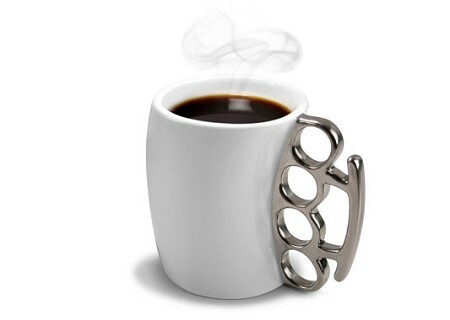 This brass knuckles coffee mug perfectly combines our desire to tackle the day with gusto and also request that please no one talk to us until we've completely consumed our coffee. We love coffee. We want to spend some time enjoying it. Let's not make this ugly. Doesn't it just say, "punch today's lights out!"? We think so too. You can pick up your own Fisticup on Wow Cool Stuff for $15.50.